Numbers and politicians tell us we are winning the war along our Southwest border. A closer look and inside view tells a very different story. The nearly two-thousand-mile border between the US and Mexico is more heavily fortified, patrolled, and watched today than at any point since the US-Mexico War in 1846-48. Back when America annexed Texas in a de facto declaration of war. Those were the days of cavalry charges, hard tack and a crumbling relationship with a largely demoralized Mexico. In some ways, not much has changed since then. Today not only do Americans still ride horses looking for foot-borne interlopers, but at the other end of the technological spectrum, drones fly overhead capturing human activity on glowing screens down below. The United States Border Patrol has taken on a military look as camo-clad troops man forward operating bases, unmanned aircraft patrol the sky, and blacked-out helicopters with thermal imaging systems cruise the fringe of US airspace. Remote sensors are hidden in the stony ground—magnetic ones to detect vehicles, seismic ones to report foot traffic. Towers fixed with remote controlled infrared cameras turn lines of sweating migrants into glowing white blobs as sensor operators monitor movement in the star-filled desert night. As law enforcement has improved and increased its interdiction tactics, the smugglers have responded by becoming more creative and aggressive. Creative use of tunnels, jetski’s, ultralight aircraft dropping bales of dope in the US, pneumatic cannons shooting canisters of dope over the border fence, and catapults lobbing bales to our side. 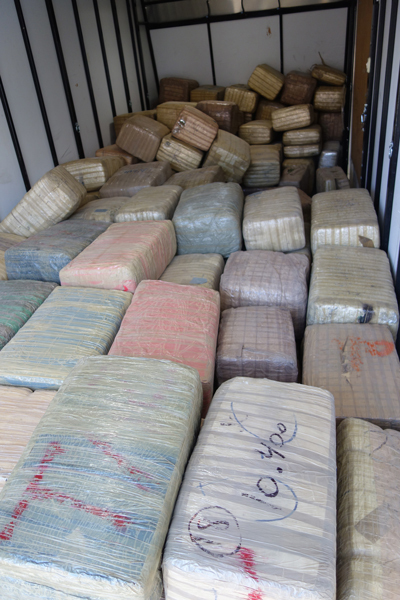 A trailer load of 50-pound bales of marijuana. More aggressive by arming many interlopers and creating a bloodbath along the border as they fight for turf and manage both labor and employees, the Mexican cartels are responsible for the more than 60,000 people that have been murdered in the long-running drug war. But many of the new ideas are old. Modern technology and tactics are often be frustrated by simply hiring swarms of desperate runners to carry bales of dope on their back across the border, overloading the ability of US law enforcement to stop the business of men and dope from crossing every night. Other statistics from VADER documents show that the apprehension can be as high as 50%. But the overall reality is that there are for more people crossing the U.S. border illegally than law enforcement is able to deter or apprehend. As with any commodity, all the producer has to do is keep increasing the flow and volume to match the demand, and build in the additional costs into the cost of the product. For example the fee to smuggle humans has risen dramatically. 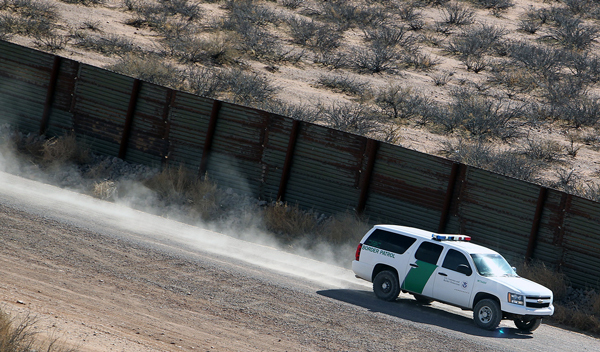 Crossing into the US illegally costs more and is more difficult than it was 10 years ago. A gardener in Southern California, originally from central Mexico, paid $1,200 to be smuggled into the US in 2003. Like a lot of illegal immigrants, he works in the US, wires money home to his family, and travels between the U.S. and Mexico on a regular basis. After 30 years he’s never been caught, and the coyotes don’t charge unless he is successfully delivered to his U.S. destination. The same trip that cost him $1,200 in 2003 now costs him $5,000. Before, it was a specific spot near Tijuana and a quick run at a predetermined time. Now it’s an arduous two-day trek that starts in Tecate and connects with a desolate strip of highway that dips south from Interstate 8 near San Diego. The 55-year-old laborer does not look forward to his next return trip to the US. It’s a grueling overland march through harsh desert that kills a lot of immigrants. Exactly how many people illegally cross is unknown, but the estimated amount is usually extrapolated as a greater or smaller percentage of those caught. Official U.S. border patrol sources estimate that 40% of all those who try to cross into the US illegally are successful. Only about 16% of those apprehended are actually prosecuted. That would put the number of successful penetrators at around 892,000. But there are some factors the numbers don’t reflect. Many illegals commute back and forth across the border. Many are turned back and try again. So the potential number may be much lower…or much higher. The official word from Washington is that everything is good on the border. Secretary of Homeland Security Janet Napolitano held a photo opportunity to tell the assembled media that the border situation is improving. Random samplings from cold-hearted machines reveal more disturbing statistics. On March 23, 2012, along a 12-mile stretch of federally owned Arizona borderland, 330 illegal aliens were monitored successfully crossing into the Tucson sector from Mexico—one using an ultralight aircraft. If the entire border saw that much traffic that would be 2.38 billion people illegally coming into the country each year. Thankfully, the entire border doesn’t see that much traffic, and the focal point of illegal entry seems to be a narrow corridor in Arizona. Our porous border is not defined by the millions of industrious-but-illegal laborers. It is defined by the amount of violence, drugs and criminal activity. It is not just people that are moving across the border. It’s also drugs. Last year along the Southwest border, Border Patrol seized nearly 2.3 million pounds of marijuana, 6,000 pounds of cocaine and 3,400 pounds of methamphetamine. According to an April 2013 report by the Congressional Research Service, marijuana cultivation in Mexico doubled between 2006 and 2011. In 2006, there was an estimated 21,250 acres of marijuana growing in Mexico, which produced an estimated 34.17 million pounds of ready-to-use marijuana. Cultivation estimates today are closer to 50,000 acres. The US government believes that drug-trafficking organizations send between $19 billion and $39 billion of drug-related revenues back to Mexico each year, though the Mexican government disputes these dollar amounts. The drugs come north, the guns and money go south into Mexico. The illegal immigrants also come north, but they’re not the problem. The problem is the nature of the drug trade and what’s known as spillover violence. The US approach to the problem has been billions of dollars worth of infrastructure, deploying 18,500 Border Patrol agents, and implementing the latest technology to find and grab smugglers. South of the border, they have a more old-school approach. 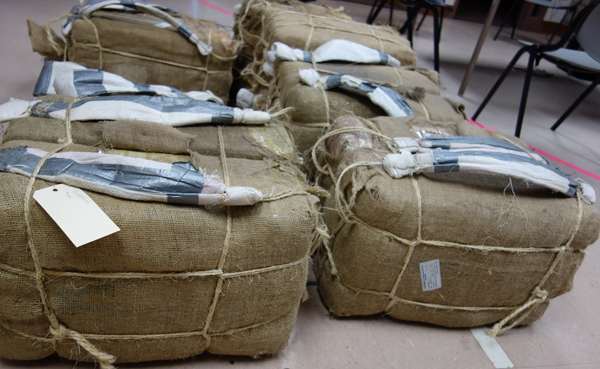 The cartels compress the marijuana into a 50-pound bale, wrap it in packaging tape, and walk the drugs into the US. As it turns out, Mexican “mules” (people hired by cartels for grunt labor) still transport a lot of dope into the US. About half of all marijuana seized along the entire Southwest border is picked up in the Arizona wilderness. The empty southwest corner of the state is the thoroughfare for a million pounds of weed a year, most of it packed into 50-pound bundles and humped 10 nights through the desert. Dangerous wanted to find out firsthand if the in-flow of drugs through the Sonoran Desert was as high as those working there say it is. How are untrained “mules” walking through a web of US law enforcement that’s more equipped, trained, and coordinated than ever? How are the smugglers able to do it every night of the year? Interstate 8 crosses the southwestern corner of Arizona from Casa Grande, which is just south of Phoenix, west to Yuma, California. The highway cuts through Maricopa County, the fourth most populous county in the nation, and the Sonoran Desert—sharp basalt ridges, plains of thorny scrub, old saguaros as tall as pine trees. That stretch of Interstate correlates with the US-Mexico border from Nogales, Sonora to San Luis Colorado, Sonora, basically the diagonal southwest edge of Arizona. During the day, not much appears to happen out there. Traffic flies east and west down the Interstate, the gas stations are full of minivans and motorhomes. But at night, and to a degree during the day, more marijuana is smuggled into the US through that section of desert than anywhere else in the country. 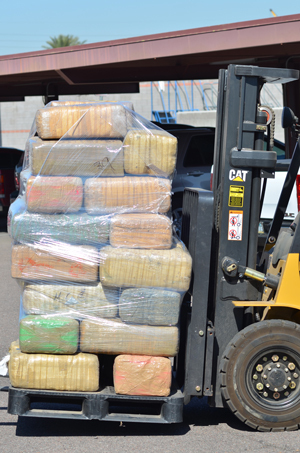 According to the Department of Justice, about half of the nearly 2.3 million pounds of marijuana seized in the US in 2011 was confiscated between ports of entry in Arizona. That means marijuana goes overland through the desert. Groups of half a dozen to a dozen backpackers will walk eight to 10 nights through the desert carrying a 50-pound bale of dope with homemade straps fashioned from seatbelts, burlaps sacks or rope. As padding, they’ll put a piece of foam between the pack and their lumbar. They usually carry a small bag of cornmeal for tortillas, some over-the-counter speed, Vaseline for chaff, a personal stash of weed, and a few other affects. The guide, who is the only one who knows where the dope will be delivered, carries a radio and usually the food and water, and sometimes a light pack of dope. If you drive Interstate 8 from Yuma to Casa Grande on any given night you’re likely to see evidence of the smuggling. If you drive it every night for a week, it’s almost guaranteed you’ll see either law enforcement at work or the cartels at work. To the drug interdiction teams out there, every car stopped along the highway at night is worth watching. Any car driving dirt roads in the vicinity of the Interstate is worth watching. During two separate trips I’ve made, each about a week long, to ride with law enforcement along the 8, the cops have made interdictions and arrests every night. The White House Office of National Drug Control Policy has a term for areas like this: High Intensity Drug Trafficking Areas. There are 31 of them in the US—from Miami to Seattle to Tucson. The Arizona HIDTA includes eight counties: Mohave, La Paz, Yuma, Maricopa, Pinal, Pima, Santa Cruz and Cochise. Looking at a map of the Arizona HIDTA counties, there’s a clear in-holding along the Mexico border that’s exempt from US law enforcement. It’s the Tohono O’odham Indian Reservation and the cartels fully appreciate its value. To the west of the reservation is the Barry M Goldwater Air Force Range, which the cartels also run through. 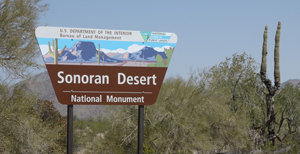 A smattering of public land covers the surrounding area: Organ Pipe Cactus National Monument, Sonoran Desert National Monument, Cabeza Prieta National Wildlife Refuge, and other tracts of open land. For the cartels, the goal is to get the drugs in a car on Interstate 8 bound for a stash house in Phoenix. Once the drugs are in a relatively normal looking vehicle (not one that’s covered in camouflage tarps or looks like it’s been driven hellbent through the desert all night), they’re a lot harder to recover. At 3:30 in the afternoon we fill the vehicles with fuel. 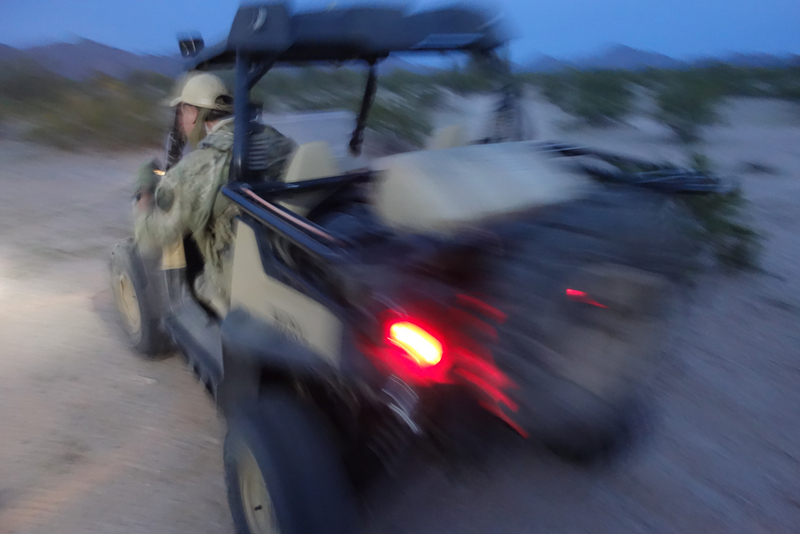 I’m riding shotgun in a military-grade Polaris MRZR ATV with two Maricopa County HIDTA Task Force agents. 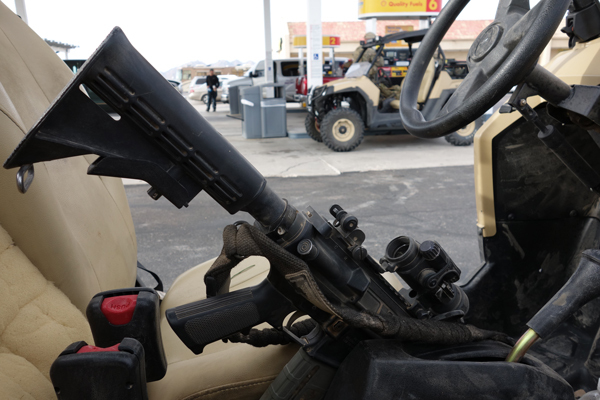 We pull into the Shell station for gas, the two operators wearing their full kit and their M4s propped in the drivers’ seats. Children buy candy bars while parents clean out the minivan. There are seatbelts on the ATV, but they’ve never been used. As we fly down the dirt roads across BLM land, the RZR floats over the dirt and drifts on the gravel. The guys drive these roads five times a week and know the tangle of dirt tracks and dry washes like a farmer knows his pastures. The operators are looking for tire and foot tracks. As we drive up the washes, the driver zigzags in a snake-like pattern, cutting the wash with angular tracks. If another set of tires drives over his tracks, it’s almost certainly bad guys. There’s rarely anyone else out here but law enforcement and drug smugglers. Every track is investigated. We come to a bottleneck between two ridges used for smuggling. There’s one tree out here among the cactus, and in the shade of the tree five water bottles lay discarded, along with some odd shreds of clothing and an old shoe. The smugglers all use bottles the size of a washer-fluid bottle and painted black. Law enforcement suspects that the smugglers think black bottles are hard to see through night vision. The tree is about three miles south of Interstate 8 and offers the only shade for several miles. It’s a well-used patch of dirt, packed hard from however many weary backpackers resting within reach of the end zone. From this tree south of the Interstate, the guide will recognize different peaks north of the highway that correspond with the mile markers. Most likely, the packers will wait until dark to approach the highway. A few hundred yards within the Interstate, the crews, in the past, would dismount their packs, cut the straps off, and wait for the sound the rumble strips as the pick-up vehicle moved in. That’s what they did before law enforcement starting busting them at the staging points where they removed the straps. Now, the smugglers don’t stop. Instead, they’ll be in radio communication with a scout positioned on a mountaintop observation post and go straight to the waiting vehicle. The smugglers are better coordinated than ever before. And many of their tactics closely resemble those of US law enforcement. There’s a faint, two-track road that runs out of the bottleneck, away from the shade tree, toward the highway. We can’t hear or see the Interstate from here but the road is clearly headed that way. When law enforcement focuses on an area (or method) of intense smuggling, the cartels shift to different routes. 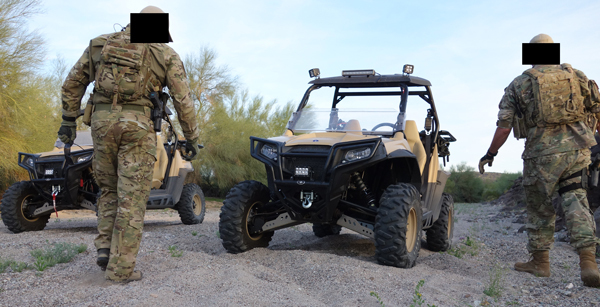 The smugglers may not find the motion-sensor game camera that saw them or know that a HIDTA operator is sitting on a ridge six miles away watching their every move, but they do seem to know when law enforcement consistently shows up one step ahead of them. It’s fair to suspect that when cops recover $1 million worth of marijuana, heads are apt to roll within the cartel network. The smugglers go to great lengths to avoid detection in the hundreds of square miles of rugged desert that forms the doorstep between the US, specifically the metropolitan Phoenix and Tucson areas, and Mexico. Because the smugglers continually change their tactics and smuggling routes, finding them isn’t easy. The Maricopa HIDTA Task Force under Lt. Bailey has been learning on the job since it began such interdiction operations in 2009. What started out as a couple of cops hiding in the borrow ditch waiting for a car loaded with dope has evolved into the acute targeting of smugglers through advanced communication, intelligence and tactics. In fact, Bailey’s approach to the problem surprised even some within the Maricopa County Sherrif’s Office. “Oh, yeah,” I told him. It’s fully dark as we’re crisscrossing drainages looking for tire tracks. The guys get a call over the radio that a U.S. Border Patrol STOL (short take off and landing) Pilatus aircraft is watching a Chevy Impala drive out of the desert. The Impala is several miles from the Interstate, and the different teams in vehicles and on the ground move into place to make an interdiction. For us, that means we need to be five miles east of where we are, and the guys waste no time getting there. The ATV in front of us throws a screen of dust that reflects our headlights and blinds us. Ditches show up suddenly and we skid into them. We slide around turns and bounce over ruts. Our road, and wild ride, ends at the Interstate, and we get out to wait. The aircraft has eyes on the Impala as it creeps toward the highway at five miles per hour. We’re standing on the shoulder of Interstate 8, leaning on the ATVs as traffic roars buy. We’re told over the radio that we need to be closer, and we’re driving alongside an 18-wheeler at 60 miles per hour. I wonder what people must think of a couple of ATVs full of men in camo with guns driving down the Interstate at night. We wait close at-hand on the shoulder of the Interstate while another ground team moves in for the interdiction. The guys I’m with are ready to jump in to help, but they’re not needed. Three hundred pounds of marijuana confiscated, and a 35-year-old Hispanic female in custody. We drive back on the highway to the station in Gila Bend. The woman is a legal US citizen, just trying to make some easy money driving a load of dope for the cartels. The drugs were intended to be handed off to her to be driven to a stash house, probably in Phoenix. She’s a mule of a different breed. She’s facing six years in a federal penitentiary for conspiring to smuggle drugs into the United States, among other charges. 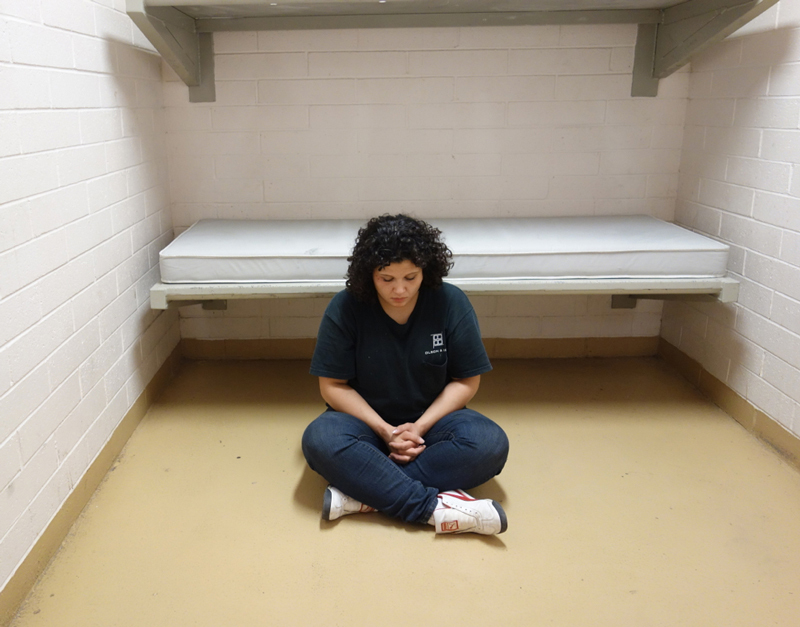 The officers tell me that if she behaves well in jail, and if her face doesn’t show up in any incriminating photographs in the system, she could get out in a year. In the 1980s and ’90s most illegal drugs came from Colombia into the US through Florida. Those were the heydays of the fast boats and cocaine cowboys, the inspiration for Miami Vice. Eventually, the violence drew in US law enforcement to the degree that the cartels sought another route of entry. The next best option was the soft underbelly of the nation along its border with Mexico. The move brought in Mexican middlemen and gave rise to the Zetas, Sinaloa, Gulf cartels and others that control the business today. The Sinaloa cartel controls the plazas, or cartel areas of operation, that fall under Bailey’s jurisdiction. Once a load of Sinaloa dope makes it to the Interstate, it’s well on its way to high schools, colleges, and shopping malls across the country, traveling from the Southwest mostly on Interstate 40. The breadth of the problem, frankly, is not known, since what goes on in Mexico isn’t fully clear. To Bailey and his men in Maricopa County, all they can do is handle their part of the network, which in 2012 yielded about 30,000 pounds of marijuana, worth approximately $15 million on Phoenix streets, and five times that on the streets of Hartford, Connecticut. Bailey makes it clear that when they seize a thousand pounds of marijuana, they’ve disrupted the flow of the organization, but they haven’t dismantled it. Someone within the cartel will be held accountable for the lost product but more will be sent up to make up for the shortage. If law enforcement maintains the pressure, activity in that area may slow. “While we’re patting ourselves on the back, the cartel’s down there recruiting another 10 or 20 guys to do the same job somewhere else,” Bailey says. That’s a big part of the problem. Business in Mexico carries on. The marijuana grows all year. Tarahumare Indians are lined up just south of the US line waiting for a job carrying dope. After they drop their loads, many of the mules walk back to Mexico. Law enforcement has made a habit of photographing the bare chests and shoulders of apprehended mules to look for callouses that betray more than a single trip carrying a bale of dope. Other mules stay in the US and see the job of running the drugs as an easy, and profitable, way into the US. Secretary of Homeland Security Janet Napolitano visit and rosy view of the border. Rubs those on the ground the wrong way. The more than 13 percent increase in arrests as of March this year compared to last year is a sign of increased penetration, not better law enforcement. Bailey’s teams have also confiscated more drugs this year than at the same time last year. I’m sitting in the station in Gila Bend in the middle of the afternoon when four of the HIDTA operators roll in covered with dust, frustrated, and holding an SD card from a remote game camera south of the Interstate. They crowd around a laptop computer and scan the images. A pickup truck covered in camouflage tarps is slightly blurred, clearly moving at speed. The driver is leaning out the window because a tarp covers the windshield. The bed of the truck has high sides, and if there ever was a photo of a truck loaded with contraband speeding through the desert, this was it. We pile into the ATVs and pick up the track of the truck near the camera. Two mismatched tire tracks ensure that we’re not following a law enforcement vehicle. The truck drove through the barbed-wire fence on the side of the Interstate, crossed the Interstate, and broke through the fence on the other side. The tracks cut straight through the desert. The smugglers drove over cactus and through patches of scrub, hardly caring to avoid anything that might pop a tire. Which tells the HIDTA guys that the smugglers know law enforcement is on the trail—because a flat tire is as much a pain in the neck for the smugglers as anyone else. We find a piece of a bumper and a scrap of plastic from the truck. We also find two bales of marijuana that fell out during the bumpy ride. We’re still following the tracks three hours after sunset. And then we hit a blacktop highway, and the vehicle is gone. After 38 miles of hard tracking, we have 100 pounds of marijuana to show for it, and the guys are disappointed. Two days later at 9:00 A.M. I’m sitting in a hotel room in Phoenix when I get a call that members of the task force are headed to Phoenix with 3,000 pounds of marijuana seized the night before from two stolen trucks. It turned out to be 3,764 pounds of dope, and it was enough bales to partially fill a 30-foot cargo trailer. 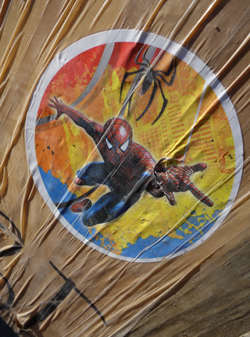 Many of the bales were marked with a name, like Tio, or a sticker, like a Spiderman sticker. The US Postal Service and FedEx use tracking numbers to route packages; the cartels use stickers. The HIDTA men formed an assembly line and loaded the bales onto carts. They’d had been working in the desert since 3:00 P.M. the day before and were tired and dirty and ready to go home. What we found in Maricopa County is that the influx of drugs on a nightly basis is at an alarming level. Even though law enforcement is equipped with night-optics devices, ultra-bright Surefire weapons lights, military-grade ATVs, and communication and surveillance systems, they intercept only a fraction of the cross-border narco-traffic. If we calculate the total amount of marijuana just coming through Maricopa County based on the HIDTA team picking up 15 percent of total narcotics, 200,000 pounds of marijuana come through the county a year. It’s common knowledge that the cartels account for product lost to law enforcement. The marijuana is cheap to grow, the mules are cheap to hire, and the losses when using backpackers are generally less than 1,000 pounds. It’s not a fancy way to transport drugs, but the cartels wouldn’t do it if they weren’t making money at it. The border is more porous in some places than others. South of Interstate 8 where the 4.4 million-square-mile Tohono O’odham Indian Reservation shares a border with Mexico, there’s no fence to obstruct foot traffic. It’s an undeveloped stretch of international border that’s vast space defeats the best efforts of the agents patrolling it. To get a better idea of how many mules make multiple trips, the HIDTA Task Force now photographs the chests and backs of apprehended smugglers to look for callouses caused by the rough-hewn straps cut from burlap sacks. The high percentage of repeat offenders is not unique to Bailey’s area of operation or even Arizona. Across the board, 56% of immigrants arrested at border ports of entry had been arrested on a previous occasion. The Obama Administration’s crackdown on repeat immigration offenders has resulted in a record number of federal prosecutions for people illegally entering the country, making the penalty for getting caught more severe. The cartel network is also as dangerous as ever. But despite the heightened risks, they continue to come. From Mexico, Guatemala, all of Latin America, India, even Syria. The massive build up of infrastructure and manpower on the border has generated changes in numbers—lower arrests, more drug seizures, longer fences, more drones. While politicians use statistics and cameos to leverage agendas, the boots on the ground say there’s been little change in the inflow of narcotics of illegal aliens. Not since Zachary Taylor crossed the Rio Grand and invaded Mexico has the border been so militarized or fortified. Yet our southern frontier remains as permeable as ever. Very interesting article. Would love to see a follow up article investigating the increase through the US northern borders, ie, what and who are entering illegally, and how. I did read an article recently indicating items being launched into the country, and also items and persons entering via canoe. howеver I thouɡht this post waѕ once ɡood.